Poland on Friday gave the go ahead for large-scale logging in the Bialowieza forest intended to combat a spruce bark beetle infestation, despite scientists, ecologists and the EU protesting the move in Europe's last primeval woodland. "We're acting to curb the degradation of important habitats, to curb the disappearance and migration of important species from this site," Jan Szyszko, environment minister with Poland's right-wing government told journalists. 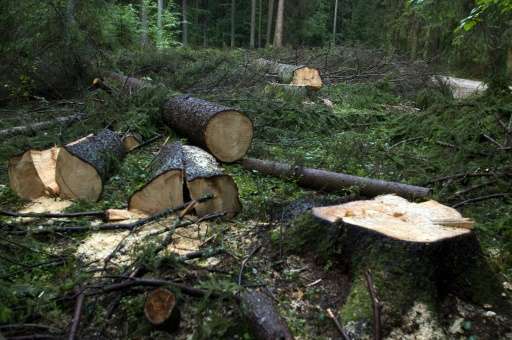 But under the new plan, loggers will harvest more than 180,000 cubic metres (6.4 million cubic feet) of wood from other areas of the forest over a decade, dwarfing previous plans to harvest 40,000 cubic metres over the same period. Vowing to protect the forest, Greenpeace accused Szyszko of "ignoring the voices of citizens and scientists, the European Commission, UNESCO and conservation organisations." Sprawling across 150,000 hectares, the Bialowieza forest reaches across the Polish border with Belarus, where it is entirely protected as a nature park. It is home to 20,000 animal species, including 250 types of bird and 62 species of mammals—among them Europe's largest, the bison. Europe's tallest trees, firs towering 50 metres high (164 feet), and oaks and ashes of 40 metres, also flourish here, in an ecosystem unspoiled for more than 10 millennia. I as just thinking about the US national parks and forests being the next gas and oil drilling sites and here is proof we have no conscience but money.